Being someone who wears makeup often and have sensitive skin, I often have to keep my skincare routine in check and make sure I double cleanse whenever I remove my makeup to prevent my pores from clogging. Therefore, it is also essential for me to indulge in facials once in a while to make sure that my skin is clear from any excess dirt on my face. 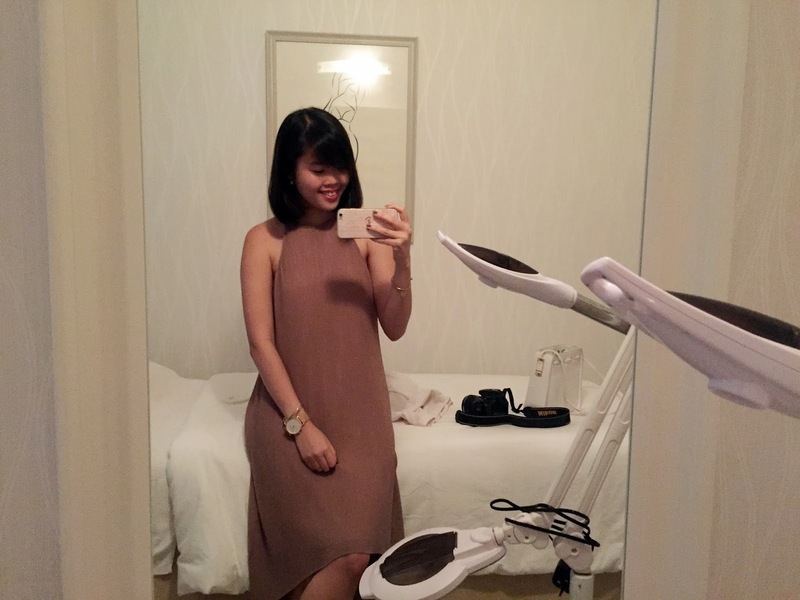 Thankfully, I was presented with an offer to try out a facial session at SkinLab The Medical Spa and I immediately jumped on board after reading quite a number of good reviews online! Their Medical Spa has built a reputation of excellence by providing treatments to consistently high standards. Their beauty therapists have a minimum of five years experience both locally and abroad and have certified training. They also undergo continuous weekly assessments and on-the-job training. 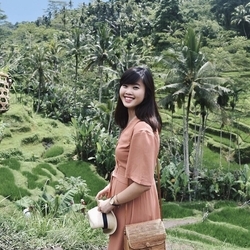 Upon reaching the SkinLab, I was given a form to fill in any concerns I had about my skin as well as my lifestyle routine for the doctor to recommend the best facial treatment for my skin! 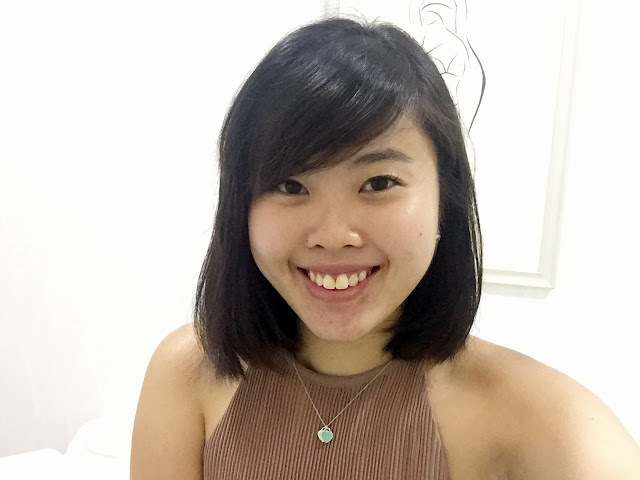 I also had a consultation with the dermatological doctor, Dr Kelvin Chua, to find out which facial treatment would be the most suitable for my skin type. He also accessed the kind of products which I have been using on a daily basis, and whether these products are suitable in helping my skin become better. Since I had mild acne around my chin and have slightly sensitive skin, he highly recommended the Salicylic Acid Peel Facial. For those who were wondering, Salicylic Acid is extremely gentle on the skin, and dissipates as soon as it comes in contact with the water vapour in the air. This treatment is able to unclog pores and remove impurities and dead skin cells. In order to ensure better results, the skin will also be infused with a customised blend of mild fruit acids to lighten a dull complexion, surface pigmentation and blemishes. 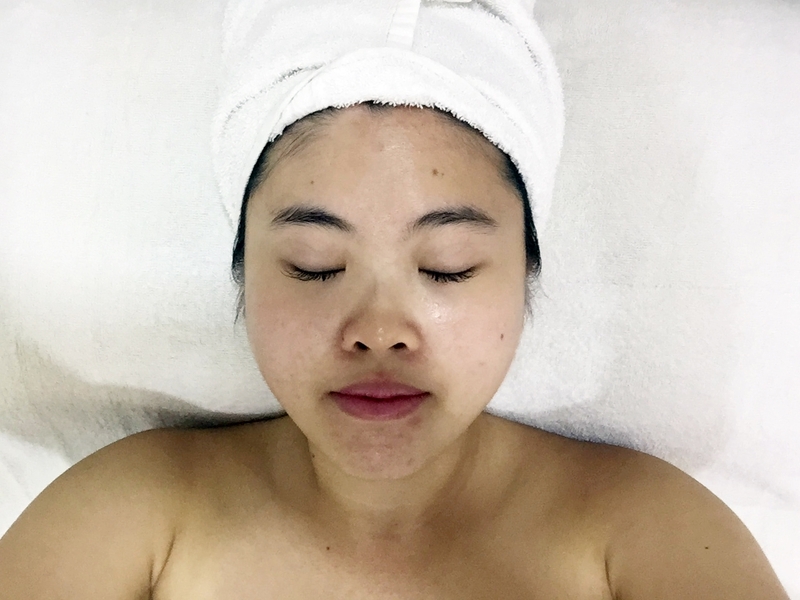 Lastly, the treatment will see the therapist applying a skin-clearing, whitening serum, finishing off with a mask that allows the skin to rest and regenerate! After the consultation, I was then brought to the room to start my facial! I was first given a welcome massage (with Lavender oil which made it so calming!) and a double cleanse so as to remove all the makeup and impurities on my face with the cleansers that the doctors at Skinlab have specially concocted. The facial therapist made sure to inform me of each and every step and product before applying it on to my face. Here's a picture of my face before I started with the Salicylic Acid treatment! 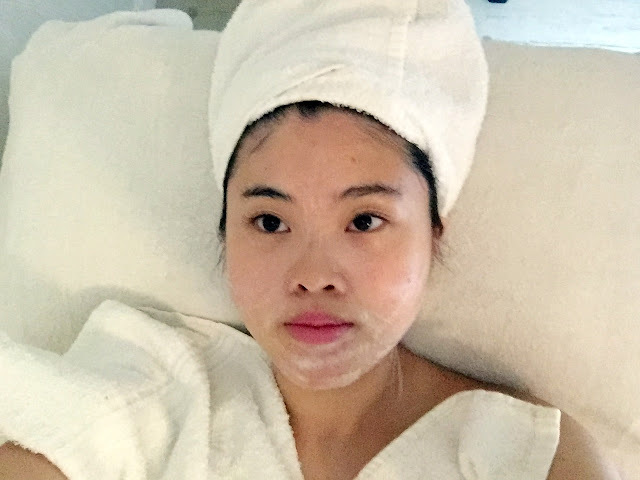 For the treatment, I was given a higher dosage of Salicylic Acid on my chin (around 10-20%) as this was the most problematic area on my face when it comes to acne. 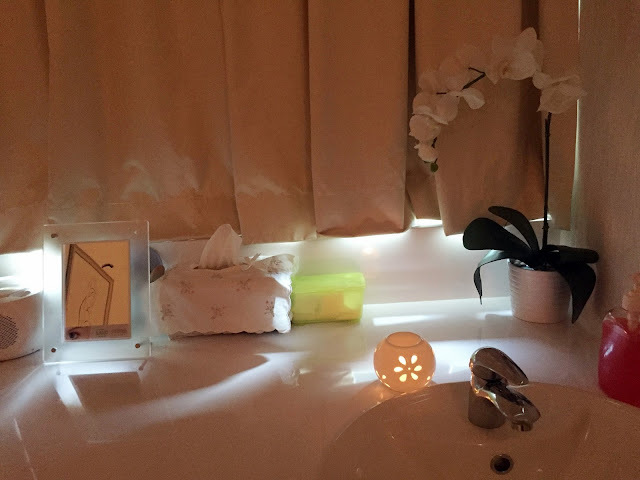 The facial therapist was extremely gentle during the process, and there were rarely any discomfort - except for the tingling and ticklish sensation I felt at certain points of the treatment. 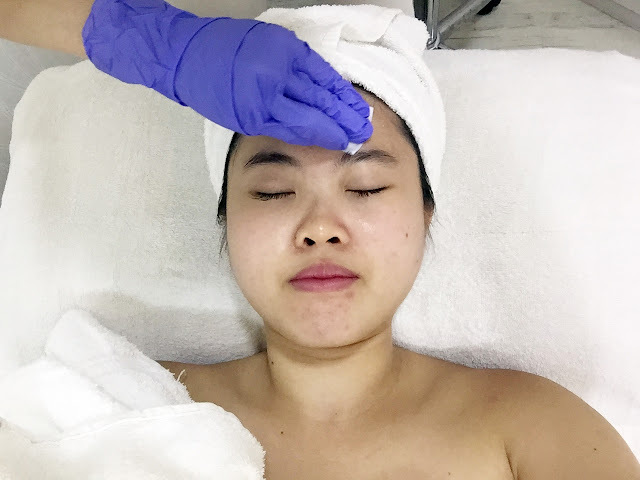 For those who feel any form of discomfort during the session, you can also inform the facial therapist about it and she will readily wipe it off or decrease the dosage! And here's a picture after my treatment and my face looks visibly brighter! The facial therapist then went on to dab my face with rose and strawberry infused water - the rose water helped to add moisture while the strawberry water helped to reduce any form of inflammation on my skin. 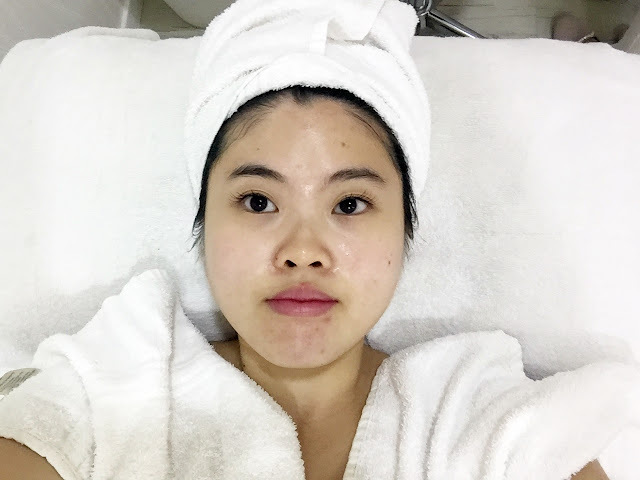 After which, she then went on with the extraction - the part which I am most afraid of in any facial treatment as I abhor the feeling of having each and every pimple and blackhead squeezed out - plus I had really horrible experiences in the past. Thankfully, it wasn't as painful as I expected as the facial therapist was rather nimble and skilled with her extraction techniques! She also did a little brow trimming for me - something which I desperately needed because my brows were getting out of hand. Hahaha. 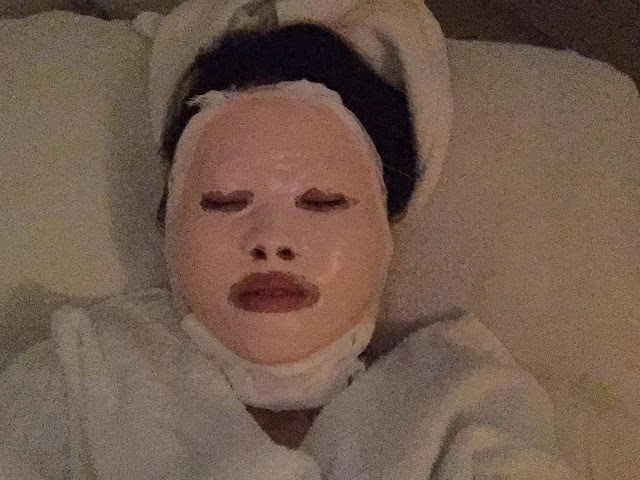 The facial then ended off with a Hydrating and Brightening mask which was applied all the way to my neck! The facial therapist also gave me another round of face and shoulder massage with the use of lavender oil and I fell asleep soon after because it was just too comfortable. Hehe, I really loved her massage because she covered all my aching nodes and my shoulders immediately became less tense after that. The facial therapist then applied the anti-blemish ampule and applied sunscreen on my face before concluding the session! Another picture of my face after the facial! My face became slightly redder due to the impurities that were squeezed out of my pores during the treatment. My facial therapist also cautioned me about pimples forming up in the next few days as the salicylic acid would penetrate into the skin to push out any congestion deeply hidden in my face for a thorough cleanse. True enough, I did experience two pimples on my chin around 2-3 days after my facial but they healed rather quickly! Overall, I would say that the facial treatment was extremely therapeutic - unlike any facial treatments I have received so far. I have always had a fear of going for facials as I loathe the extraction process and the pain I have to undergo each and every time. Thankfully, I did not experience any of it with SkinLab and I could see the results almost-immediately after my treatment. And of course, the facial and body massages which helped me sleep better in the night! For those who are interested to try the facial at Skinlab The Medical Spa, each treatment is going at S$268 per session - pretty affordable judging by the results I've had!